There is no single economy. An economy is like a “culture”, an eco-system. One can be agressively dominant and dictatorial. Yet another can be cooperative and delivering sustainable progress. In this article I let you decide for yourself. When I invite people to “my world” they are first surprised and then curious. What world is he talking about? For most people there is just the one world-view and that is the one we live in today, no questions asked. The possibility that we can live in different worlds that look exactly the same but function exactly opposite, is weird and strange to most. Funnily enough it is true and possible and I am demonstrating it in practical reality. Allow me to explain how it works. When you understand you can do it yourself. You will have a choice. A puzzle consists of many pieces that fit together to make a large picture. Our current societies are puzzled together using a particular format that I refer to as “a money driven consumer economy”. This means simply that the puzzle pieces (think of all the institutionalized structures such as a government, the many businesses, large and small, and also the people who live in such society, the schools, the scientific research, the religions, the newspapers etc) all connect together through this common denominator of money and consumption dependences. We consume health care, education, housing, food, energy, etc and need money to do so. We are very used to this puzzling format and hardly ever question it. It looks and feels normal since it has been like this for many generations. Even when the puzzle pieces break down, crumble or do not fit anymore, we suffer a crisis or even confrontations (war, economic sanctions, etc) but do not dispute the big picture. This consumption based, money driven society has worked relatively well for many decades but now shows important problems due to the consequences that such society causes. These consequences are also translated into a new type of (secondary) economy, “the economy of consequences” that grows exponentially faster than the primary consumer economy. It is also money dependent and develops its own hierarchies of power and authority. The problem we face is that both economies depend on each other and both collapse due to the unsustainable nature of both in the current puzzling format. Expressed in money this is not such a big problem. We can assume a big national and global debt and compensate. Money is a human invention that can be considered a catalyst for some as well as goal for many. But expressed in terms of human and ecological ethics around sustainable evolutionary progress we see that the consequences cannot be expressed in money. Our lifestyle purely around consumption without taking responsibility for our health and surroundings creates a lethally dangerous situation for humankind all together. Although many wise people try to solve the issues without challenging the puzzling format we see that not only economies collapse but also our sustainable evolutionary options as a species. The problem we face is not just organizational (to do) but also ethical (to be). We then also face a huge discussion worldwide on the principles of defining “ethics” in terms of behavior and responsibilities. What we are really doing is disputing our way of puzzling sustainable life together. 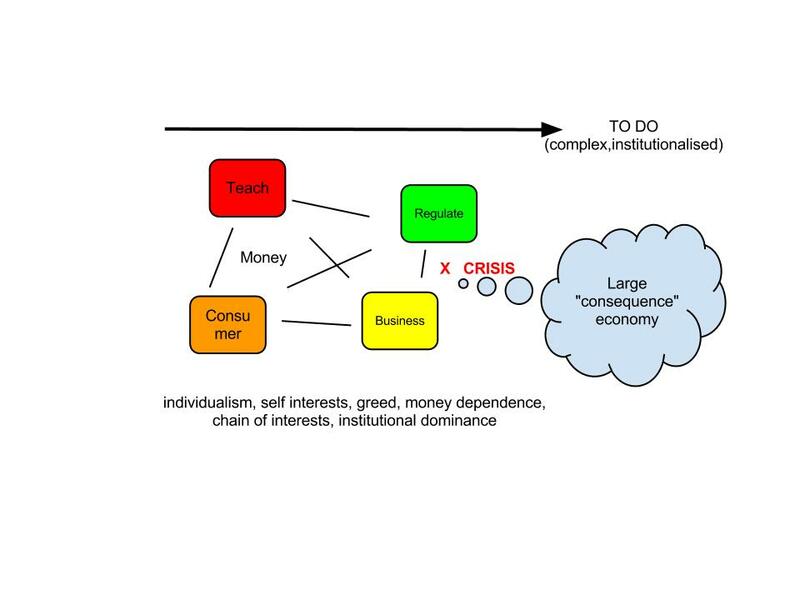 I came to the conclusion that the chain of money driven interdependence will never get any institution to take responsibility for the entire human sustainable progress because each has an excellence in a fragmented specialization. Every institution has a mission to sustain itself and was never conceived to sustain humankind. The only way to place the human being at the center of our global and local puzzling would be to physically do so. So no institution but me myself as a single representative of humankind with only one purpose “sustainable human progress”. What that means was for me to find out. I did and now invite fellow human beings to join me after I had clarified the mission. Sustainocracy was born. It became a personal choice to stop depending on the institutions that surround me but to take personal responsibility and invite institutions to join ME. The world upside down, people said. And this is true, and indeed as simple as that, a turnaround choice. But it has a great logic. Institutions are fragmented specializations that I consider my tools to shape sustainable human progress. The tools are not the master, I am. A crisis is a “perception of suffering” with the choice to adapt. To symbolize humankind I placed my independent self at the center of the puzzle and invited all specialized puzzle pieces to join me. The institutions also need direction to stay alive. The old dot on the horizon for institutional continuation or growth was obsolete because it was becoming overruled by the consequences. 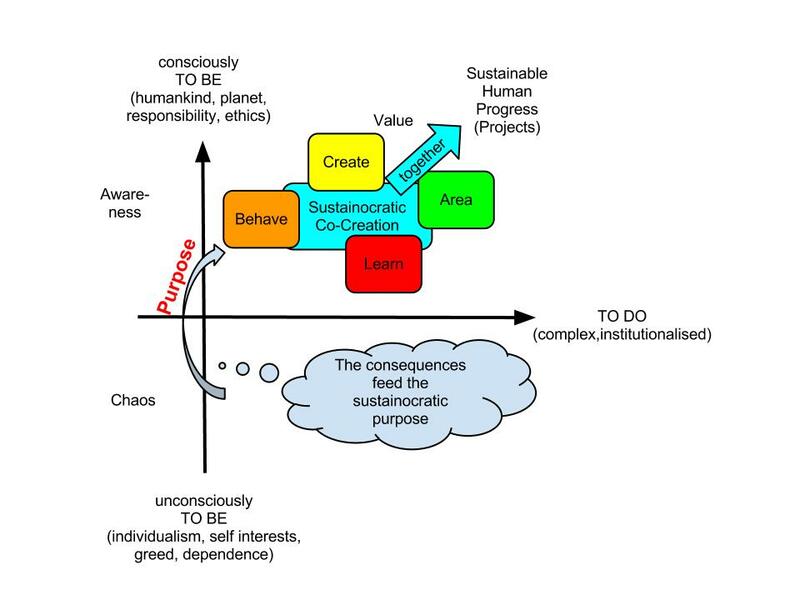 I defined and introduced a new dot on the horizon through my own definition of sustainable human progress. This dot cannot be disputed because it has to do with scientifically and historically proven stability of society and human evolutionary progress that everyone understands. Who can be against human “health” for instance, or “safety”? Against “self sufficiency” I can imagen strong economic forces that depend on the contrary (such as debt), so that becomes a challenge. But the two worlds of dependence and independence can perfectly well co-exist. So why worry? When we address our responsibilities today within Sustainocracy we know our ideals (sustainable human progress) and enter a democratic discussion on the level of deviation from it. We then determine co-creative priorities to get back on our evolutionary track based on human and environmental wellness rather than just economic growth. In the old reigning world the puzzle pieces talk about climate changes, health care, welfare diseases, pollution, overpopulation, costs, etc and make it a money issue. In my new sustainocratic world the puzzle pieces talk about health, safety, self sufficiency, a healthy environment, reciprocity, values, etc and make it a responsibility issue. Yes I can. You can too. It just takes some convincing but people in charge of all kinds of institutions are human beings too. They can see the problems that arise in society if we stick to the old format and they are willing, if they can, to experiment with new ones. They just need to be convinced that it is also worth their while to use their authority in a new way. Sustainocracy is highly constructive and provides much more authority building options that the collapsing nature of the consumer based economies. Powerful people in the old world run the risk of being blamed for human disaster. In Sustainocracy they remain in power and show responsibility. For some their personal choice is easily made. First of all you have to BE Sustainocracy yourself. That is not that difficult. Just imagine your own carnal self as an independent self sufficient human being that is willing to take responsibility for your own sustainable human progress. You simply create then your own new democracy based on that progressive dot on the horizon. The surroundings will react to your commitment to a new world and you will find difficulties in implementing it. We call this a transformation, a paradigm shift, which occurs when you cannot move back anymore and need, through co-creative cooperation to make this new world work in your own surroundings. It has of course important consequences for your own life because you detach from the comforts of an obsolete but still powerfully functioning broken up society. Your new world is starting totally empty and you are there to build up your own new securities. Why would institutional professionals join you? They don’t. People who join you do this first as a human being. If they happen to carry professional responsibilities then you may find them in a position to use that authority to make a difference. That is not at all that evident. People with hierarchical leadership positions in the money driven world may find themselves with great difficulties to convince their surrounding inside the institution to go along with a value driven venture. You may also find that if they are prepared in doing so they find themselves blocked by law. Many local law systems are established to government relationships in a fragmented world of customers and suppliers, finances and controllers, subsidies and subsidized etc but not the co-creating responsibilities of a purpose driven venture. Problems occur around liabilities, risks, ownership, etc. So professionals join in as human beings and suddenly find a whole riddle of problems themselves in the execution of their jobs and their commitment to your world. Since Sustainocracy places the human being in the center of all, the troubles that people encounter show their true commitment and leadership in overcoming the obstacles. Laws have also been once created out of an ideology so can be changed when time has come. No-one has ever said modern life is easy but when we deal with true human sustainable progress and envisage a crisis that places everything in a dramatic perspective, human beings show remarkable talents of changing everything, including the constitution if necessary. The most important thing for me has been the learning process of understanding the complexity that I was facing when creating a new reality. In the process I produced various books in Dutch as an exercise to structure my own mind into workable models that I could experiment with. Writing them down in books helped me to leave the ideas behind when people asked me “what on Earth I was doing?”. I also wrote a book in English that I made available on the internet, free of charge of course, in 18 chapters. This was at a time that the word “sustainocracy” had not yet appeared in my mind but in structure and vision it can already be recognized in the book. Enjoy! In both cases the ventures were established using the new Sustainocratic puzzling, connecting local government, business, science and the local population around the common purpose. They became both the first precedents of my new world, Sustainocracy, that is evolving much larger than I can ever be. The practical examples are already gaining attention from all over the world and people are looking at “my world” even though it is already becoming “theiw own” and “our new world”. And this is just a beginning. 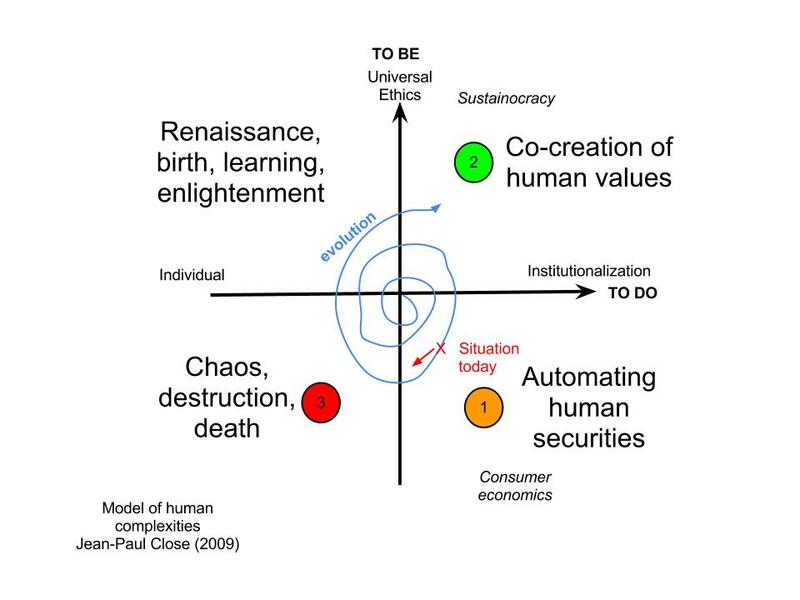 Many new complex ventures are being experimented with, with new partners and different puzzle connections, and always within the human centered format of Sustainocracy. Sustainocracy is: value driven, co-creative, local for local, circular economies, holistic, based on reciprocity, people as contributors, sharing values, harmony with natural environment, abundance, serves humankind and environment for sustainable progress. Human wellness is the goal, money is one of the many means. Sustainocracy is Consumer economics upside down, inside out, a different world. It is a self aware choice for any human being and institution. Many see it still as an experimental phase that is growing in experimental proportions everywhere. One day maybe the experiment has overtaken itself and before we know it is a new reality.